Jennitha Anto has won the gold medal at International Physically-disabled Chess Association’s (IPCA) World Individual Chess Competition five times, including this year’s edition. World chess queen Jennitha Anto. TIRUCHY: The life of this 30-year-old Tiruchy-based chess champion revolves around 64 squares.K Jennitha Anto, has won the gold medal at International Physically-disabled Chess Association’s (IPCA) World Individual Chess Competition five times, including this year’s edition. Forty men and women from 12 countries took part in the championship held from May 28 to June 5 at Ruzomberok in Slovakia. Four players from India, including Jennitha, represented the country. There were nine rounds, For Jenitha, tough challenges arose from the seventh. “My rival was Yamorov, the champion from Ukraine,” she said. Having faced the Ukrainian in other competitions, Jennitha knew what to expect and defeated her rival with ease. After scoring 5.5 points in the eighth round, Jennitha and her team knew the finals would be an outing. “My tally was 5.5 points at the end of the eighth round while girls from other countries scored just 3.5 to 4 points. That led me to believe I could win the title,” said an elated Jennitha. In all she won four games, drew three and lost two. Of the four participants from India, Shashikant Kutwal, an employee of Indian Railways from Pune, won the men’s title, making it a grand gold-double for India. Upon her return, Jenitha was given a rousing reception at the Tiruchy airport on Wednesday. Speaking to Express, Jennitha credited her father G Kanickai Irudayaraj for her success. “My father taught me chess when I was eight and encouraged me to read Will of Steel, a book of success stories of differently abled people across the globe,” she said. Kanickai Irudayaraj runs a Chess Federation for Physically Disabled in Tiruchy which is affiliated to the All India Chess Federation. It currently has around 70 children spread across 10 States in India as members. “After schooling, Jenitha aspired to study chartered accountancy. So, I made her join B.Com. Upon course completion, the only thing she took up in her hand was the chessboard,” said the 71-year-old Irudayaraj. Jenitha completed B.Com in early 2009 but had no interest in pursuing studies as she was completely into chess. Now, her goal is to achieve the grandmaster status. 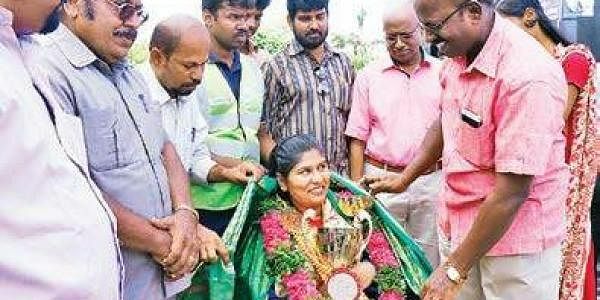 Members of Makkal Sakthi Iyakkam in Tiruchy have requested the State and Central governments to felicitate Jennitha with an Arjuna Award as she has won gold for India at international tournaments five times.